Resolution for "Sales order cannot be manually closed" conflict. QuickBooks returned an error when adding/modifying a accSalesOrder record. Why Did This Conflict Occur? 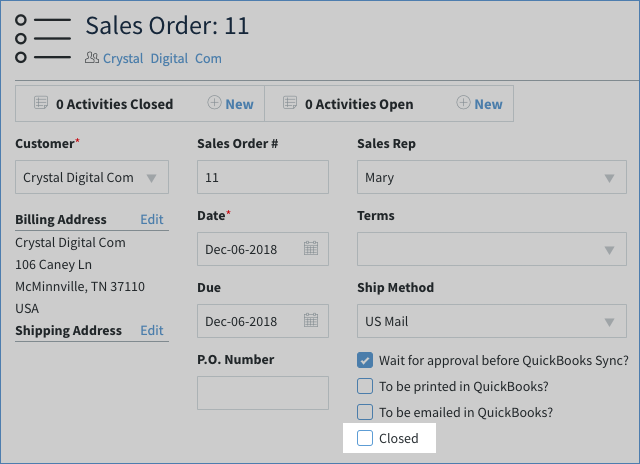 This conflict is triggered because QuickBooks rejects any attempt to close a sales order twice, which happens if Closed is still checked on a sales order. Clearing this conflict is very simple; here's how to do it! 1. Navigate to your Sales Orders App and click on the Existing Sales Orders List. 2. Use the list to locate the sales order that generated the conflict. Once you find the sales order, click on it to open its details. 3. Uncheck the checkbox marked Closed. 4. Click Save to save the sales order. You will now be able to sync the sales order with no further problems!